A takeaway restaurant called the "Obama Fried Chicken," complete with a cartoon of a smiling US President Barack Obama as its logo, has been shut by its owners, three college students in Beijing. The students said they temporarily closed the eatery yesterday because of the flood of requests for interviews from domestic and foreign reporters. This had "disturbed their business as well as their studies," according to a report in the Legal Evening News. 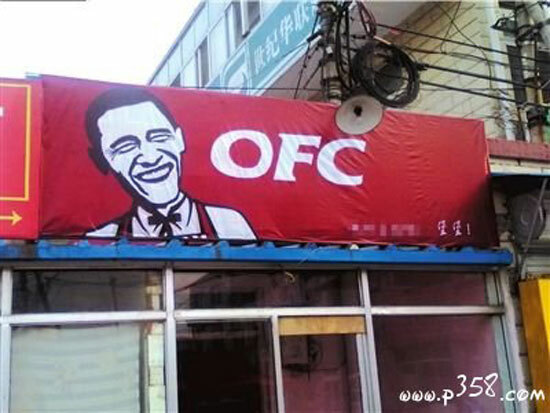 Obama Fried Chicken, or OFC, was a small rented kitchen with take-away services in premises that used to be a public bath house in the Chinese capital. It attracted public attention even before it opened last Saturday after it featured in major domestic newspapers and even made headlines abroad, including in the Washington Post. Reports focused on the fact that the eatery's OFC name was similar to that of Kentucky Fried Chicken, and its logo, Obama wearing a Colonel Sanders-style bow tie and suspenders, was also close to being a copy of KFC's. The Washington Post said a KFC China spokesman had emailed the newspaper to say the restaurant, situated near a college in Beijing, was not affiliated with the brand and the company was considering legal action. "It is a knock-off and has nothing to do with us and it infringes on our brand trademark," the email said. "We find it distasteful." The students' project also drew criticism in the US for mocking the president. In response, the students at first cut out the "OFC" letters from the sign board, leaving the Chinese words for "Public Bathing House" from the previous sign exposed. However, the Obama cartoon face remained. Then, on the day it opened for business, the students changed the eatery's name to "UFO," which, they said, indicated that the shop was an "unidentified object" to avoid talk of copyright infringement. Although business boomed thanks to the massive publicity, the students still chose to shut it down after just a few days. "Every day we receive those phone calls inviting us for interviews, which left us very embarrassed," said Zhu Baolai, one of the owners. "I didn't think much when having the idea to give it such a name and picking up Obama's figure as logo. I did that simply because I love designing." Zhu and the other owners said the name and the logo of their eatery had nothing to do with politics. They said they rented the room and decided to make it an eatery as they wanted to try starting their own business, but now their dream had faded. The students said they had torn down the eatery's sign and burned it because it had caused so much trouble.